In the dream world of project management, the right people are working on the right tasks and deliver all projects on time. In the real world, new opportunities pop up unexpectedly and often result in workload distortions. Some people get overworked and stressed, while other people’s time might not be used effectively enough. Here is a quick test for you: Imagine that Henry (below) is one of your team mates. Is he overworked or just bored? Keeping a close eye on the team’s schedule might be a tricky thing without the proper tools. With Wrike project management software, there is no need to guess what’s wrong with Henry, as the answer lies just one click away: right inside the new “Workload” view. Even a quick glance lets you easily identify that Henry is just exhausted as he heroically struggles with four large tasks this week! They are highlighted in orange. You also can see that Margaret and Jenny have a couple of slots for new tasks in their schedules. The Workload view is fully interactive, allowing you to easily optimize your team’s schedule with the drag-and-drop function. 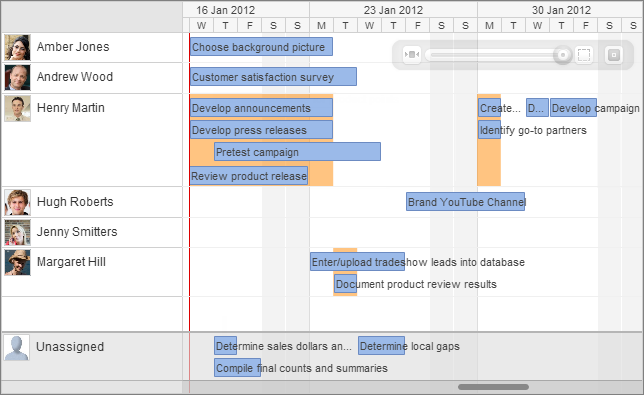 It's all very similar to what you are used to doing on the Gantt chart: you just move tasks around and edit them with easy mouse moves. Likewise, all new assignments and changes in the schedule are immediately communicated to the team via email notifications and the Activity Stream. 3) allocate the tasks to your team members in the Workload view. Even if everything is perfectly set up, don’t forget to take a look at the “Workload” view once in a while to ensure that your team’s schedule is fine-tuned, and no one is in Henry’s situation.